, D. D. was born in 1652. He was educated at Eton, and thence removed to Cambridge, where he was fellow of King’s-college in 1683, when he contributed the life of Lycurgus to the translation of Plutarch’s Lives, published in that year. 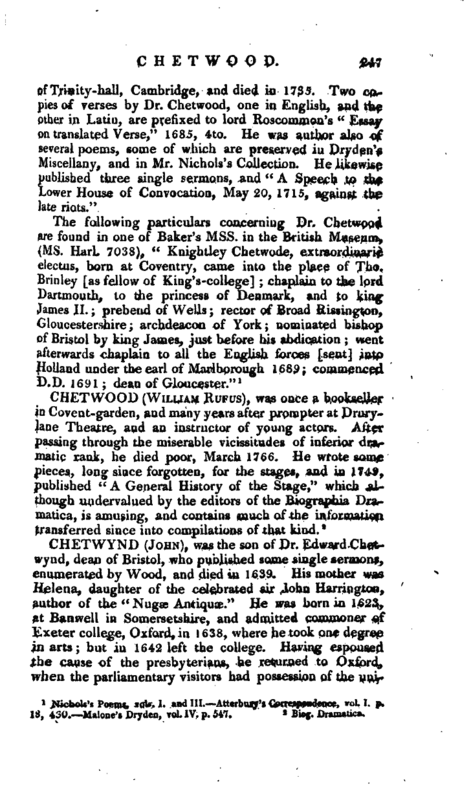 He was intimately connected with Wentworth, earl of Roscommon, whose life, written by him, is preserved in the public library of Cambridge, among Baker’s ms Collections, (vol. XXXVI.) and furnished Fenton with some of the anecdotes concerning that nobleman, which are found among his notes on Waller’s poems. 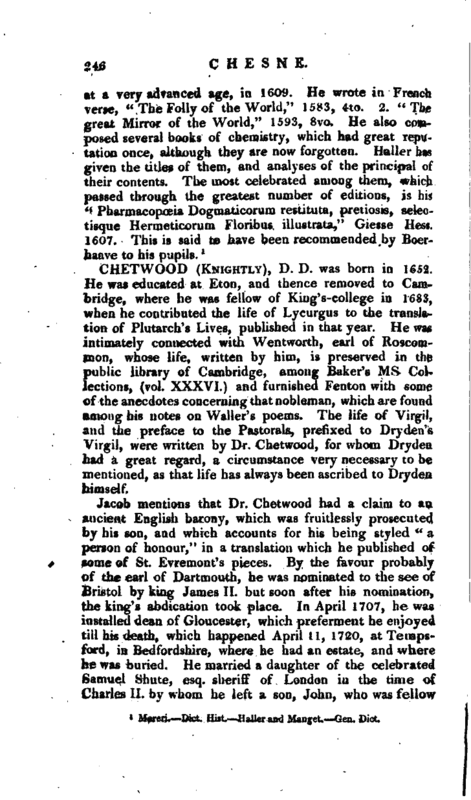 The life of Virgil, and the preface to the Pastorals, prefixed to Dry den’s Virgil, were written by Dr. Chetwood, for whom Dryden had a great regard, a circumstance very necessary to be mentioned, as that life has always been ascribed to Dryden himself. Nichols’s Poems, vols. 1. and III. Atterbury’s Correspondence, vol. I. p. 13, 430. Malone’s Dryden, vol. IV. p. 547.